Say hello to peach season, my friends. Now that peaches are found in abundance at the farmers markets, I have been buying them up as fast as I possibly can, in huge quantities. That juicy stone fruit is a serious weakness of mine, and I cave anytime I bring one of those gorgeous orbs to my nostrils and inhale that rich, ripe scent. Can you blame me? 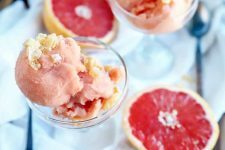 There are so many different things that you can do with peaches, it’s nearly impossible to avoiding jumping on the bandwagon and making a few summertime recipes that feature this juicy, flavorful ingredient. 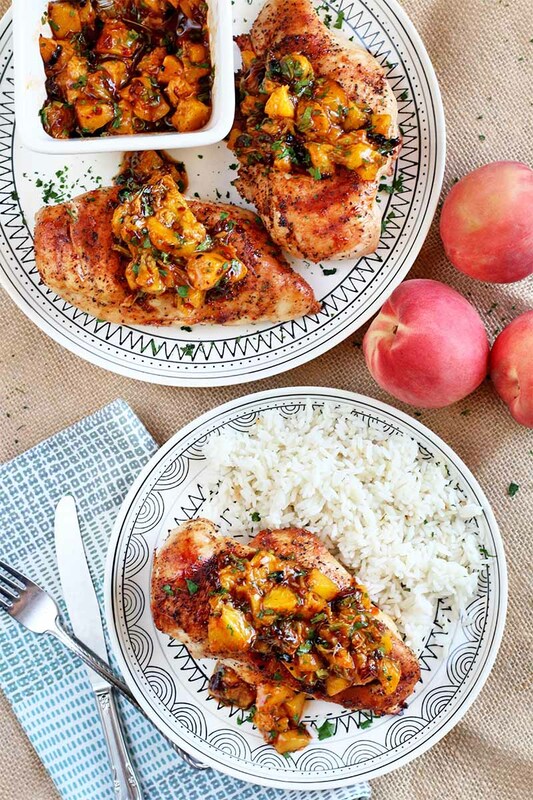 If you have never grilled peaches before, you are missing out on a supremely delicious way to experience that ripe, fresh flavor. 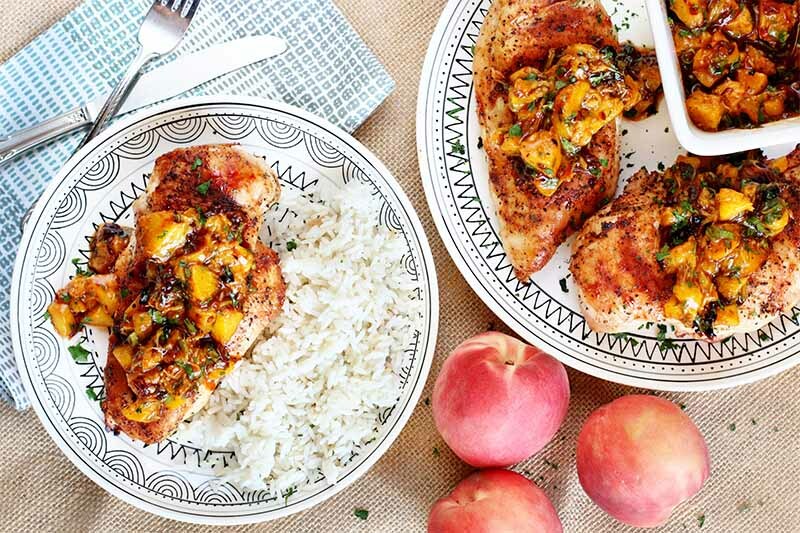 There’s something about the kiss of the heat on the grill and the slight burnt flavor that brings out the sweetness in the peaches even more than usual. 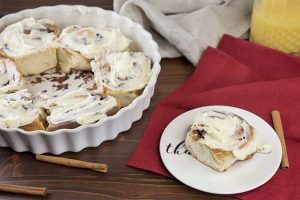 You can serve them up in a variety of ways, from sauces like the one featured here to a simple dessert with a scoop of homemade ice cream on top. 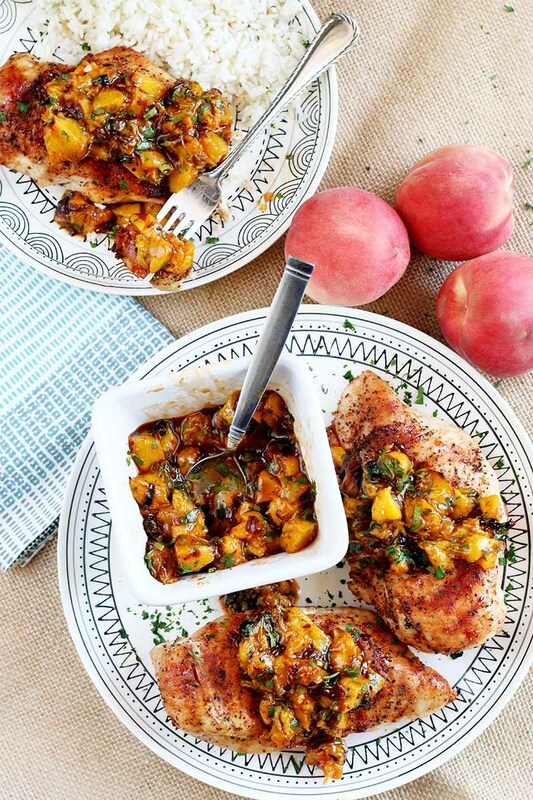 My quintessential summer cooking tip is this: Feature peaches in as many dishes as you can, sweet as well as savory. This chicken dish is one of my favorite meals so far this summer. 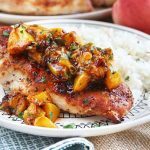 The fruit and chipotle topping is easy to make, and it offers just the right balance of flavors to create something that offers so much more in terms of flavor than a plain old grilled chicken breast. I think chipotles in adobo sauce are one of those ingredients that just aren’t used often enough in recipes. 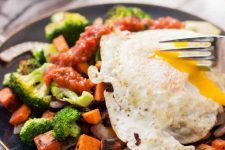 The smoky and spicy flavors that the peppers bring to the party are full of depth and richness, without being too powerful. I’ve been using them lately in a bunch of difference sauces and dips, but this is the first time I’ve added them to a chunky sauce like this one. Trust me when I say, it totally changed my worldview on this particular ingredient, and I look forward to experimenting with a variety of similar salsas. 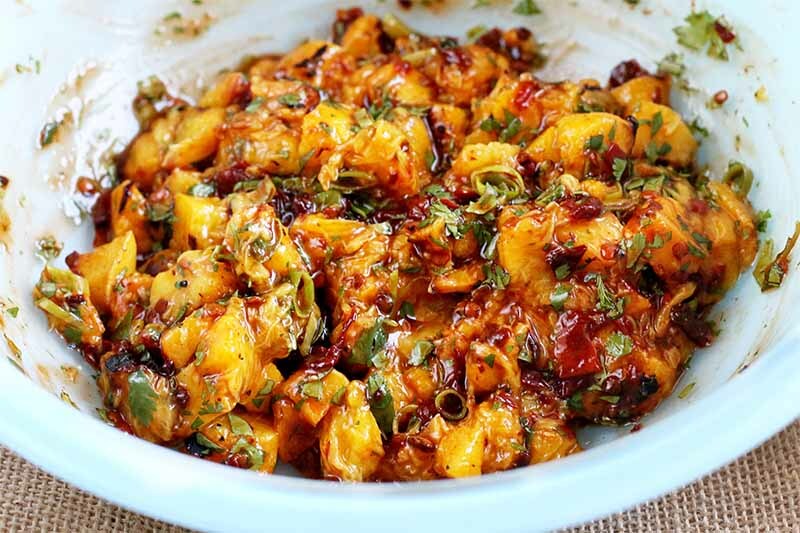 The light amount of chipotle pepper and the adobo sauce that you add to the grilled peach salsa has just enough richness and smoky flavor to balance out the sweetness of the fruit, and the brightness of the green onions that are used. 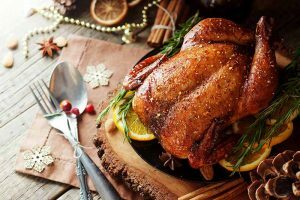 It makes for an exceptionally balanced topping for the grilled chicken that brings the poultry to a whole new level of intense flavor. 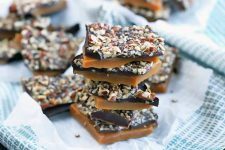 You will truly surprise anyone that you serve it up to, because so few people actually experiment with the combination of sweet and savory in their own homes. 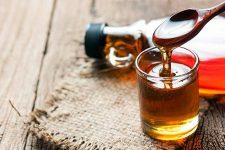 Hit all those flavor notes, and you will be so satisfied! 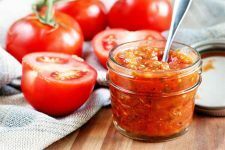 If you want to go the extra mile and make the salsa a little more spicy, you can easily add a pinch of red pepper flakes to the sauce when you mix in the cilantro, salt, and pepper. 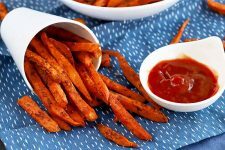 Note that the sauce already has a slight kick to it, so taste the sauce first and then stir in the red pepper flakes a little at a time if you want to bump up the heat. (And if you go overboard, we have a few tips to share to rescue your meal). Can you say, “Winner, winner, chicken dinner”? Let’s eat! 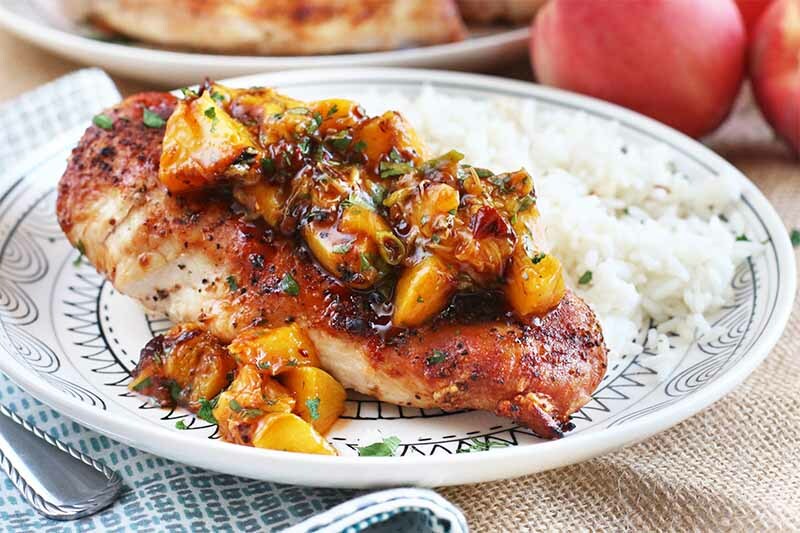 Spice up your average chicken by serving it grilled with peach chipotle sauce. 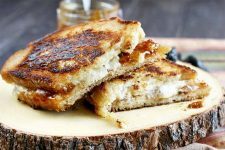 This healthy meal is smoky and sweet, and ideal for summer. 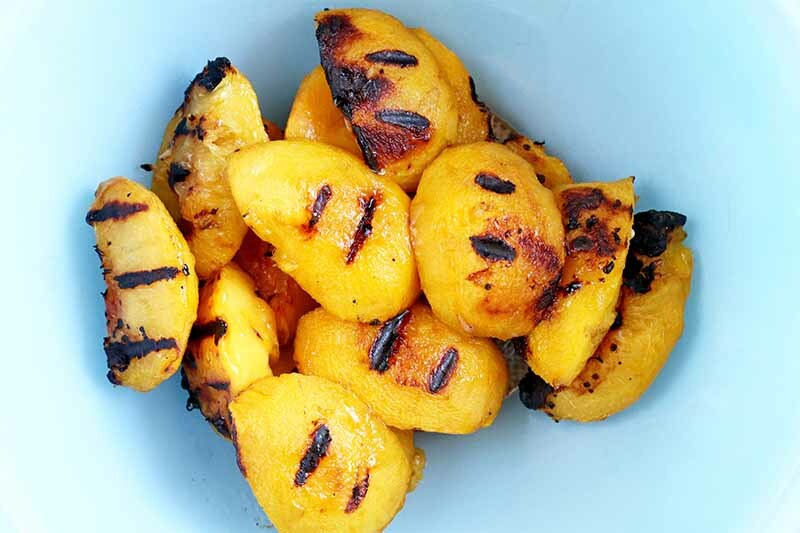 Arrange peach quarters on the grill, and cook for approximately 3-4 minutes on each side. Remove from grill and set aside to cool. 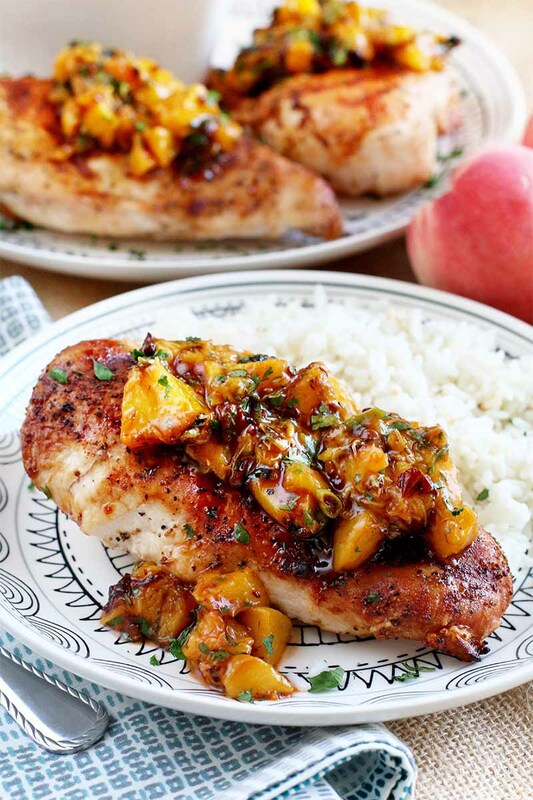 Chop the peaches and chipotle pepper. Place in a medium bowl with the scallion and adobo sauce. Toss to coat. Gently fold in cilantro, 1/2 teaspoon salt, and 1/2 teaspoon black pepper. 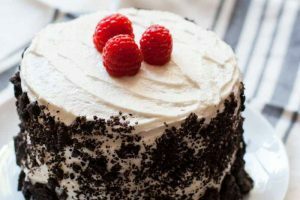 Refrigerate until ready to serve. In a small bowl, stir together with the cayenne, and remaining salt and black pepper. Season chicken breasts on both sides with the spice mixture. Place on the grill and cook for approximately 5-7 minutes per side, until the internal temperature reaches 165°F. 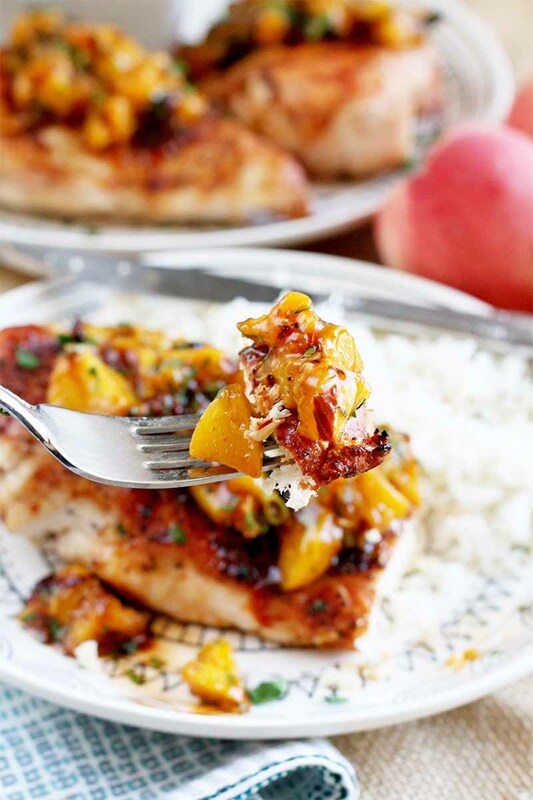 Serve immediately, topped with peach chipotle sauce. 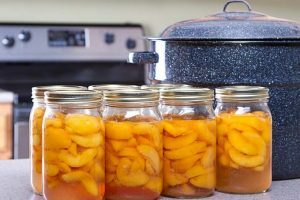 Peel the peaches, then remove the pits. 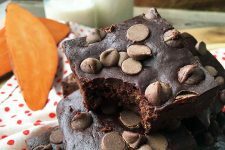 Slice into quarters and set aside. Thinly slice the green onion. Remove stems from the cilantro, and roughly chop until you have a 1/2 cup in total. Measure out the remaining ingredients as listed. 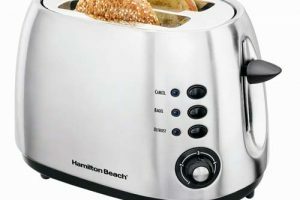 Preheat grill to high heat, Prep the grill with cooking oil to prevent sticking, and preheat on high. 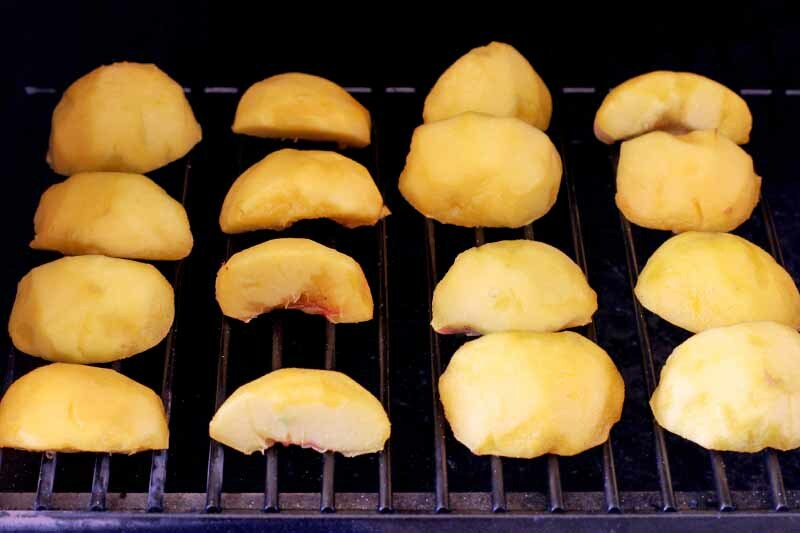 Place the peaches over indirect heat, and grill for about 3-4 minutes per side. Remove from grill and allow to cool. Be sure to leave the grill on so you can cook the chicken. 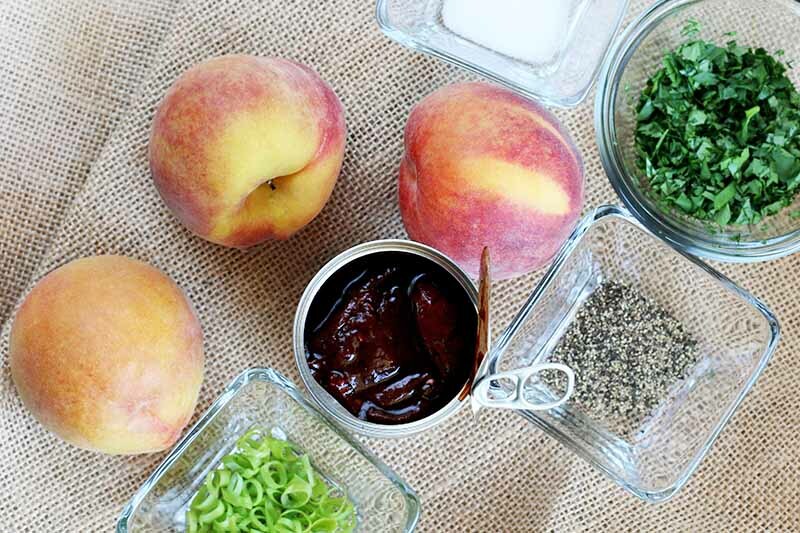 Once the peaches are cool enough to handle, you can make the sauce. Chop the peaches and the chipotle pepper. 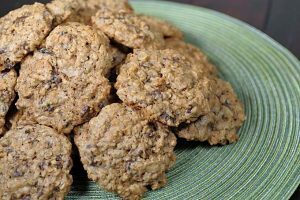 Combine these with the green onion and adobo sauce in a large bowl. Toss to combine. 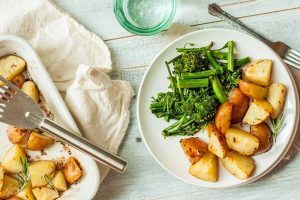 Add the cilantro, 1/2 teaspoon of salt, and 1/2 teaspoon of freshly ground black pepper, folding gently to incorporate into the sauce. 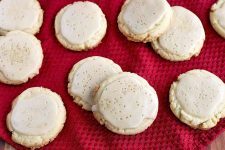 Chill in the refrigerator to let the flavors meld until you are ready to serve. 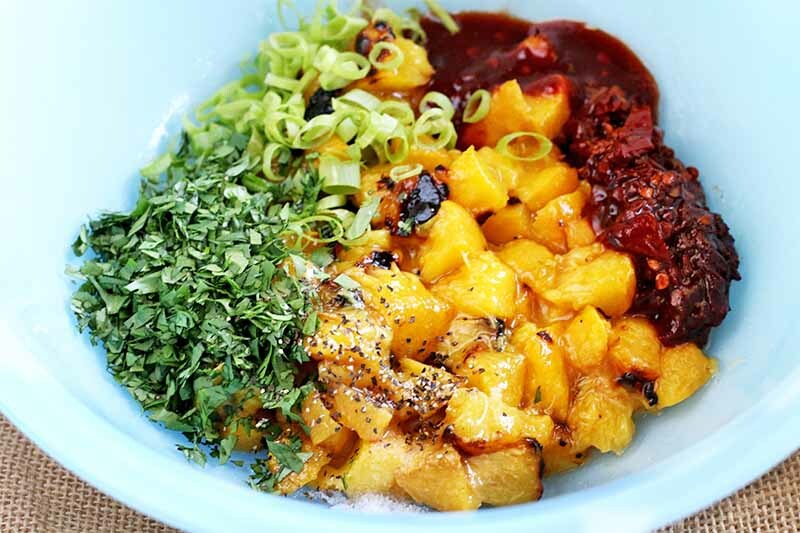 Stir together the remaining salt, black pepper, and cayenne in a small bowl. Rub the chicken breasts on all sides with the spice mixture. 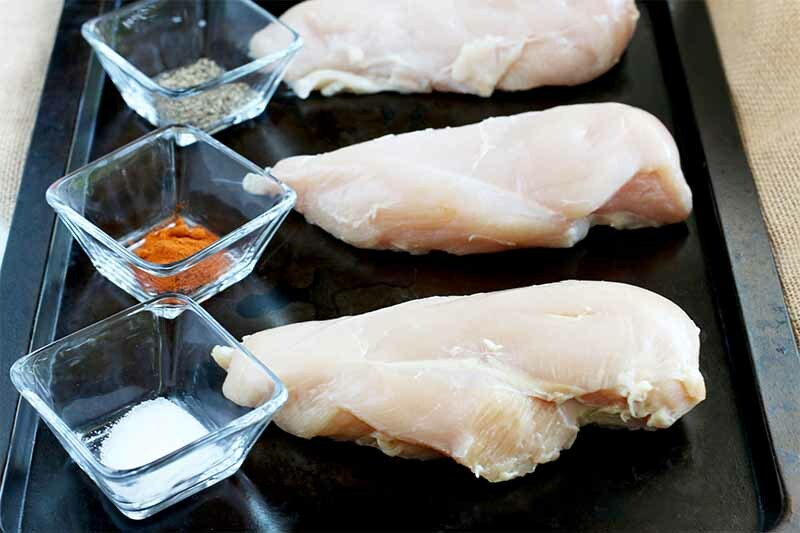 Arrange the chicken on the grill and cook until the internal temperature reaches 165°F. This should take about 5-7 minutes per side. 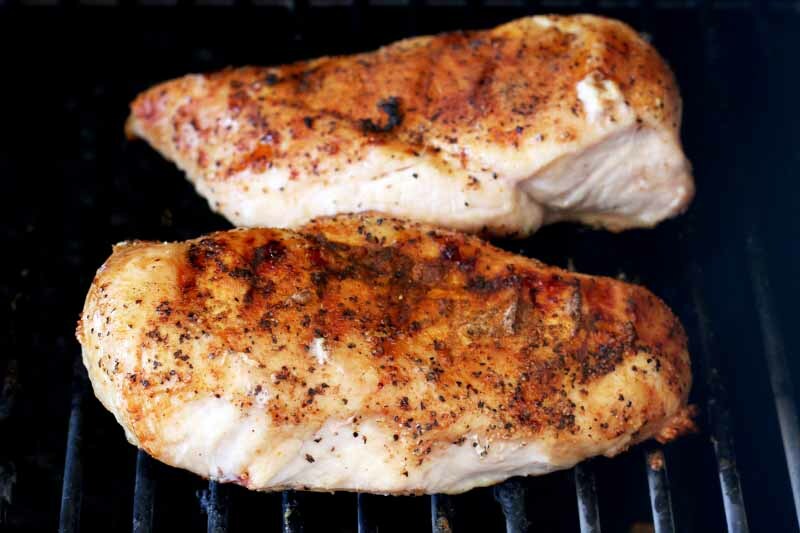 Place grilled chicken on a serving platter or plates, with a side of rice or your favorite cooked grain. Top with the sauce and serve immediately. Smoke and sweetness go together like two peas in a pod. It’s a combination that, quite frankly, screams summer. 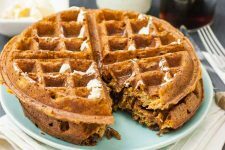 Whether it’s a toasted marshmallow that’s made smoky from a piping hot bonfire or a sweet sauce that’s made smoky with the addition of chipotle peppers, the combination is one that you have probably tasted often throughout the warmer months. An icy cold beer. 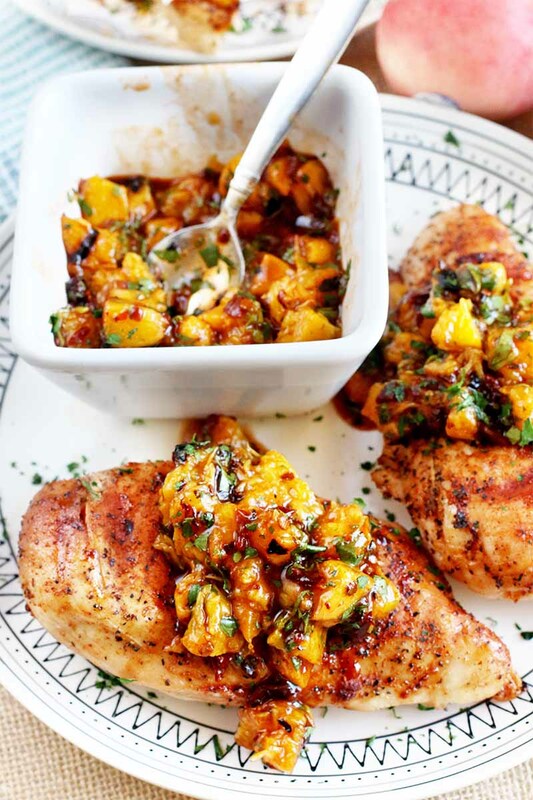 Which actually makes for a delish marinade in our other summer-friendly recipe for Grilled Lager and Lemon Chicken. 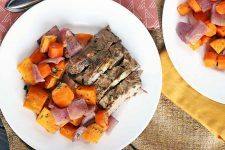 When you’re kicking back with a delicious brew and craving the perfect flavor combo to go with it, the pairing of smoke and sweet in this dish is just right to balance out the hoppy flavors of the summer beers you love to drink. The only question is, what type of pale ale would you drink alongside this smoky sweet grilled chicken dish? 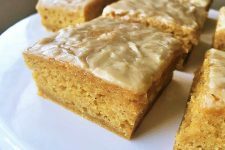 Tell us in the comments below and be sure to rate the recipe once you give it a try. Photos by Meghan Bassett, © Ask the Experts, LLC. ALL RIGHTS RESERVED. See our TOS for more details. Originally published on June 20th, 2011. Last updated: March 17, 2019 at 8:50 am. 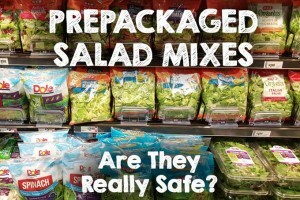 Prepackaged Salad Mixes: Are They Really Safe?